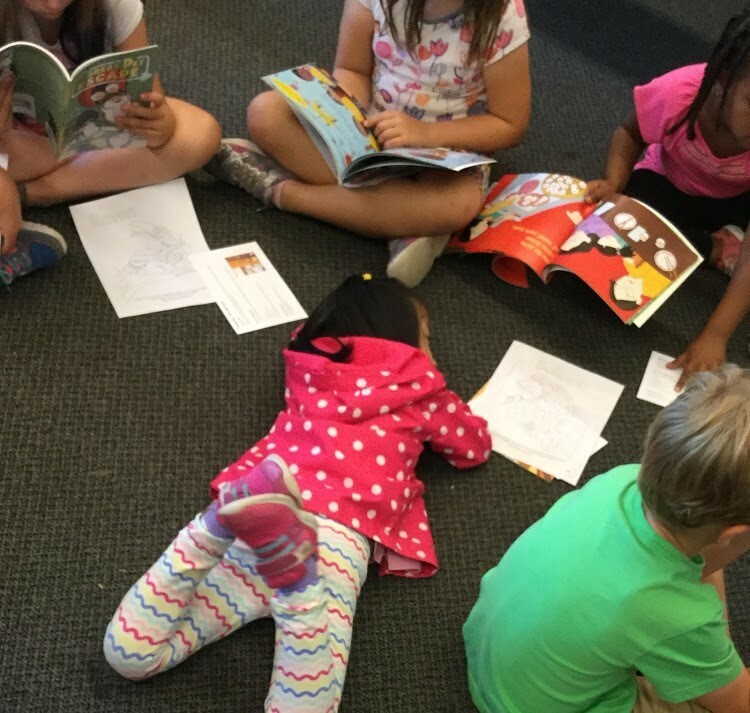 At the Newport Way Library we get to share many special moments with our community around literacy, technology, education, citizenship, careers and more. Many of these moments take place inside the library but many also take place out in the community. Below are some of our favorite events, stories and impacts that are just too good not to share. Many public service organizations, including the Newport Way Library, look at community data and trends to help us with planning. However, Rochelle, our Teen Services Librarian doesn't stop there. Through monthly Teen Advisory Board meetings and visiting the schools, she spends time listening to what teens themselves have to say, and creates original programming to directly address their needs and interests. She noted in the last year that anxiety was becoming increasingly prevalent and a serious concern in our area schools. Partnering with Tyee Middle School PTSA she arranged a screening of the documentary film Angst for parents and students. The film discusses anxiety: causes, effects, and tools to handle it. Knowing the movie would be provocative, she helped arrange a panel with a school counselor, a Youth Eastside Services representative, and a teen yoga instructor to answer questions after the movie. Rochelle also scheduled follow-up programming in the library around teen mental health and reducing stress. Another connection with teens that benefits the whole community is Rochelle's partnering with the Newport High School Robotics, Rocket, Ocean Science and STEM clubs, resulting in high-quality, original STEM programs throughout the year. 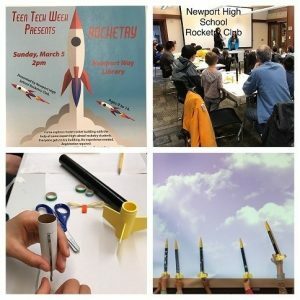 With Rochelle's guidance, and using ideaX kits from KCLS and funding from the Newport Way Library Association, students have created multiple hands-on STEM days for families. Their expertise and enthusiasm made programs with more interactive learning than the library could have created alone, while also providing valuable curriculum-planning and presenting experience for the teens. 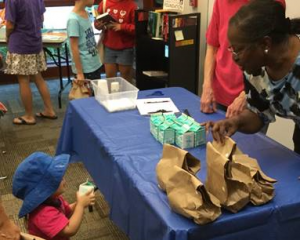 A highlight for Children's programming in the library was our free summer meals program for children. Newport Way Library Association volunteers staffed the Summer Meals sessions, literacy-trained teen volunteers read stories to children (the kids ADORED the teens! ), and staff provided additional programming and helped kids find books. With the help of the KCLS Foundation, we also gave away almost 500 free books. This was the best kind of programming because people of all ages and backgrounds in our richly diverse community worked together to create rewarding and fun experiences for all. Outside of the library, Deb our Children's Librarian leads Reading Challenges, visits schools to talk about books and library resources, and takes library sponsored programs to schools. She often sees hundreds of kids in a single visit. During the summer, though, she gets more time with early learning classes at nearby schools, and it's one of the most impactful things she does. Most of the kids she sees there never come to the library, and it is an opportunity to connect with them on not just early literacy skills and books, but with the library as a consistent, free resource that is always there for them. She visits classrooms multiple times to build a sense of connection. At a visit in the middle of the summer, on seeing Deb, a young girl ran up and hugged her hard – smiling and saying "I knew you'd come back!" As if that wasn't special enough, that same day another girl, who had received a free book on a previous visit, asked if it was ok to take another book this visit (of course it was.) She said "now my sister and I will each own a book!" These were the only two books in her home, and she was thrilled. So was Deb! In Adult Services, our partnership with the City of Bellevue has been invaluable in providing community programs. This partnership developed over time through our Adult Services Librarians attending City of Bellevue meetings and events. Working in an information organization, one of the issues our Adult Services Librarians knew they needed to take on was equipping community members with the skills to navigate Fake News. They needed serious, fact-based programming and they booked expert social media analyst and University of Washington Professor Kate Starbird. They also knew they needed a venue big enough to accommodate all the community interest. They turned to our partnership with the City of Bellevue Neighborhoods Department, who agreed to hold the event in Bellevue City Hall. Through the partnership the library was able to reach a wider audience than we could have reached alone. The City partnership has also fostered community-building programming in the library. Coordinating with the City's Conflict Resolution Center, the library hosted the city's professional mediator Marcia McReynolds. She presented on locally relevant topics including the Art of Listening, Cross-Cultural Communication, Challenging Conversations, and Resiliency Skills. The exercises in the events weren't always comfortable, and community members had many differing opinions and cultural and economic backgrounds, but they came back session after session and developed skills to help us all work together more effectively, respectfully and joyfully. Through KCLS funding and with additional support from the Newport Way Library Association we were able to offer a vast range of programming. In 2018, we offered Opera Preview, travel programs, music concerts, Hill ‘n Dale gardening programs, and MAKE programs. We hosted programs on Green Cleaning, Reducing Waste, Medicare, and Geneology. We provided informative programs on financial aid and applying to college, AP and SAT test prep, and STARS care-giver training. We had on-going programs to bring people together, including English Story Times, Chinese Play & Learn, Talk Time and two book clubs. On top of that we had some just plain fun stuff including art journaling, Life-size Candyland, an Escape Room for all ages, and Community Taiko drumming. Newport Way is a busy community hub! These are just a few of our stories, and there are many more moments like these happening every day at the library. If you haven’t visited us lately, stop by for materials or a program or just say hello and be part of our community. See you at the library!